Buckeye water and water mist units provide effective and economical protection for common combustible fires. The water mist unit uses deionized water and incorporates a unique spray nozzle. These features make it safe for use on energized electrical equipment. 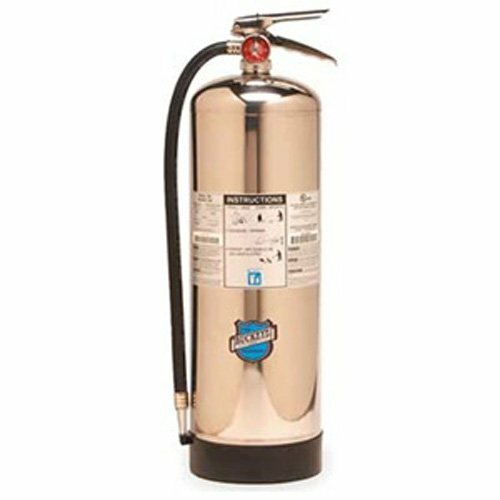 Water mist is considered to be the #1 extinguisher choice for libraries and hospitals. Water and water mist is suitable for use on Class A fires. Water mist is suitable for use on Class C fires. Typical uses for common combustible fires in offices, classrooms, churches, parking garages, and hotel/motel assembly halls and guest areas. For common combustible fires in businesses such as retail stores, light manufacturing facilities, research facilities, auto dealerships, vehicle/aircraft/marine service centers, and manufacturing processes such as painting, dipping, and coating. The extinguisher nameplate incorporates bilingual operating and maintenance instructions. Industrial grade steel and aluminum cylinders with polyester powder coating designed to withstand harsh environments and rough usage. Available in English/Spanish and English/French. 2.5 gallons agent capacity. 2-A UL rating. 50 second discharge time. 100 psi operating pressure. Wall hook included. Dot compliant. Measures 7-inches diameter by 9-inches width by 24-1/2-inches height. Guardian G1540BA Eyewash Additive for Aquaguard Gravity-Flow Portable Eyewash, 8 oz.